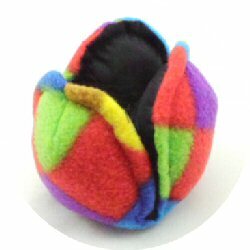 Description: : Fun with Fido interactive treat toys feature a treat pod which is shaped like a ball. There are two options - the treat pod which can be thrown like a ball or the tuggy which has the treat pod at the end. A treat is hidden within the treat pod by opening up the three sections. These section then close together like a flower petal and are held in place with Velcro. The dog discovers the treat by opening up the sections. 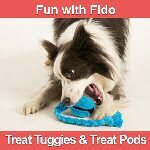 Fun with Fido treat toys can be used for play or training and are very effective for activities such as agility, flyball and scent work. I compete in Flyball with my dogs - three collies, one Springer X collie and a Working Cocker Spaniel - and so I am always looking for interesting and fun toys to encourage the dogs to come back to me as quick as possible. Two of my dogs are very food motivated and, as I am always looking for an interactive toy, I thought this would be a good one to try out. Fun with Fido kindly sent me a selection of five toys - Small, Medium and Large Neoprene Pods, Extra Long Fleece Tuggy and Short Fleece Tuggy - so I was able to try them out on all my dogs. What did you like about these products? 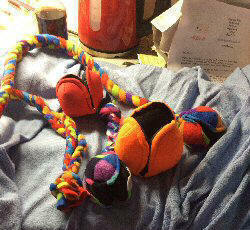 These toys proved very popular especially with my nine year old Collie. My dogs were able to catch the ball and return it to me to get the treat from inside. I liked the fact that the treat was difficult to get out as, for me, I want my dogs to return to me with the toy before getting the reward. My Springer X Collie is a determined dog and he opened the large toy to gain his reward. I shall be using the one with the long tail for Flyball with Izzy, my youngest dog who is just starting out in her Flyball career. The bright colours were appealing to me as was the choice of material - either fleece or water resistant neoprene. The different sizes makes the toy suitable for dogs of different sizes. I particularly liked the small toy on a long tuggy. This is very useful in Flyball to gain the dogs focus at a lower level. All the toys washed very well with no colour loss. What do you think could be improved? I don't think anything could be improved. Please comment on any instructions that come with this product. The instructions for this product were very good and explained how to use the toy in clear and friendly language without being patronising. They even recommended that they dogs be allowed to open the toy themselves to get the reward. There were also clear washing instructions. What did you think of the design and quality of production? The toy was durable and very well made. The Velcro closures were securely sewn on and showed no signs of wear, even with my larger dog. I think the toys represent very good value for money. They can be used for a wide range of dogs. I would recommend these to friends and family. Sharon Tuffnell has owned dogs for over 30 years and has been involved in training the dogs for different disciplines over the years. 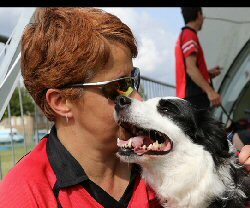 She currently owns five dogs and does Flyball with four of them - BC Jet Border collie (12) has retired from Flyball after nine years, BC Winnie (9) and Spring X Collie Copper (6.5) are currently racing and Izzy, the Working Cocker Spaniel (2.5) is just beginning her Flyball career. BC Whizz (5) who enjoys walks and trick training. Sharon is a primary school teacher. First published 28 July 2017.
email your name and details to Ellen Rocco at Agilitynet today.